I wasn't sure where to post this but I could please use some help. My wife and I bought a Syberian Husky about two weeks ago, we were extremely excited on bringing her home with us. The day after we found out my wife was pregnant, this completely changed everything. As much as we both love Lilly we have struggled mainly because of my wife's pregnancy. We live in an apartment on the third floor and when I'm at work it's hard for my wife to take Lilly out for walks or for her to go potty. We have tried having family or friends keep her for a while but unfortunately no luck. We really don't want to let her go but it's unfair to her to have her in the crate for most f the day and we prefer to have her go to a family that will be able to give her everything she needs. Please don't get us wrong we were determined to train her and love her as much as we could but unfortunately we did not know we were expecting a baby. We could use any help if possible. Thank you. Where are you located? Pictures? I know there's a recent thread where a member was looking for a pup. Also, depending on where the puppy came from you may be required to return it to the breeder or rescue group it came from. Just want to add, lots of people have babies and dogs. You don't "have" to sell the puppy. It is possible to make it work. I'm located in Downers Grove,Illinois I will attach pictures in the next message. I understand a lot of people have puppies and babies but unfortunately my wife is at high risk of having a miscarriage. Such pretty markings, have you contacted your breeder? I have not but some friends did tell me to try that. I will be calling the pet store today. If she came from a pet store then don't bother, she could end up in a bad situation because she most likely originated from a puppy mill. You'd be better off trying to place her yourself or contacting a rescue to try and place her (they usually have a waiting list for people in search of puppies). Okay thank you for the help. Much appreciated. Couldn't see the pic....can you repost pics of your puppy, it may help someone here who may be interested in getting her. Ignore that, lol....seen pics, very cute puppy, lovely markings. I agree with Jessica, try and see if a rescue can help you so she is placed in a good home. You may start by not selling your puppy and instead look to rehome your puppy. Selling suggests that your pup is merely an object where here the mentality is they are family and the word sell can also suggest profit. Going into this with the right terminology could help the way people receive what you are trying to accomplish. That doesn't mean don't ask a rehoming fee, just don't say sell. Gives some the wrong idea about what you are trying to do. Rather than looking to sell or rehome your puppy, is there any assistance we can provide to help you with the transition of having a puppy AND a baby? I know you were concerned about your wife walking the puppy and taking care of it while she's pregnant. I would consider crating the puppy when you're not home, and for those times when your wife takes her for a walk, use a no-pull harness. They are less than $20, and you may even get one around $10 if you purchase one online. I actually just bought a no-pull harness and leash set on Amazon yesterday because Suka is outgrowing his old one, and it only cost me $18. These make it very easy to walk a dog. I use one for Suka because I have very bad knees. When he pulls, they ache for days. The harness got rid of that issue. When I was pregnant with my children, I used a head halter on my wolf mix. He was HUGE and much stronger than a Husky, but the halter worked like a miracle. No pulling whatsoever. I do not recommend the head halter, though. There is a big adjustment period for it and your puppy may spend more time trying to get it off her face the first week than actually walking until she gets used to it. The harness is something they don't usually have an adjustment period for and it's effective immediately. Depending on the size of your puppy, you should only have to buy a maximum of two no-pull harnesses. One until she reaches about forty pounds, and one for after that which she'll use as an adult. Some Huskies don't get forty pounds as an adult, so you may only have to buy one harness. The crate isn't a bad thing. A lot of people think confining a dog is cruel, but it's really more like a den. All of my dogs have loved their crates because it's their own personal space and they don't have to worry about the other dogs messing with them when they'd rather rest. It's okay to have her in it while you're at work other than when she needs a bathroom break. Then let her out to roam around and play when you're home. Alternatively, you can confine her to a puppy-proofed room. Once she reaches about a year of age (sometimes up to 18 months or 2 years for males), she'll start to grow out of that puppy energy and become calmer. 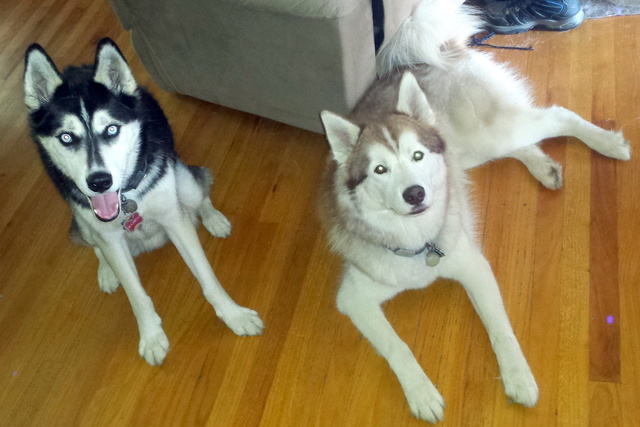 While adult Huskies can be playful and silly on occasion, they're usually well behaved in the house. Mine were always couch potatoes (of course, they also got regular walks and, on occasion, ran alongside my bike). In my experience, Huskies adore children, so you shouldn't have problems with that. Is there anything else you're concerned about that we may be able to help with? As I am wont to do, I went wondering and immediately off the rescue site that Jessica suggested above, I found 5 Dogs and a Baby - a lovely site with comments by a lady who's "been there". I have to recant somewhat, the text on the front pages is good and interesting, but there's a price tag to get beyond the front pages. Since the current OP seems adamant that they can't keep both pup and baby (and personally, I'd keep the pup) that site might not be much help, but thought to post it so others might find it. Thank you everyone for all the information. One of our family members will be watching Lilly every other weekend for us, truly glad that we found a solution. Again thank you all for the suggestions. yay! so glad to hear it. You will be happier (and so will your pup!) in the long run that you found a solution so your could all be one big happy family. As the baby and the pup grow things will calm down. Just got to weather the initial craziness of it all. That is great news. You will find a good medium between the baby and the puppy now yes! I'm glad you were able to find a solution! And if you need any help along the way, feel free to ask. Everyone here is so friendly and knowledgeable. We're happy to help out! I sympathize. When we picked up the 8 week old pup we had chosen weeks before, it was just 4 days after finding out we were expecting. And so far it's been a little bit of a rocky pregnancy so I get that too. Handling Logan's energy when I just want to sleep all the time was hard at first but walking is necessary exercise for me to stay healthy and there's no better motivation than tiring out a husky pup.